Grilled Eggplant, Basil and Cauliflower-White Bean Napoleons | This Girl’s Gotta Eat! Yesterday’s appetizer, Cauliflower-White Bean Dip, has become a delicious lunch today based on a few fresh ingredients I had laying around. Grab a fork and knife and dig in! Preheat a grill to medium-low heat. Drizzle sliced eggplant rounds with a little olive oil, salt and pepper. Grill for a few minutes per side until you get nice grill marks. To build: place one of the largest eggplant rounds on each plate, top with the cauliflower-white bean dip followed by one whole basil leaf. Continue to build the napoleon by following these layers until all the eggplant is used. 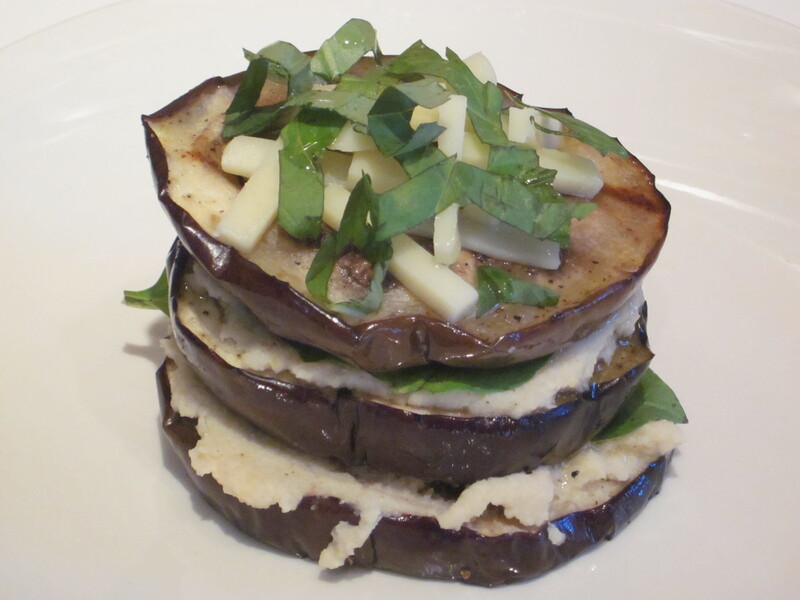 Dress the top layer of eggplant with sliced basil, fontinella cheese and a drizzle of olive oil.